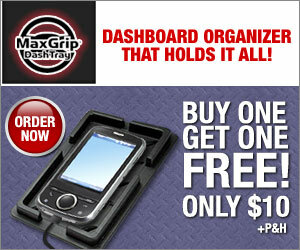 The Max Grip Dash Tray is the one accessory every car needs! It helps you keep everything you need right at your finger tips. Give your phone, iPod, glasses and anything else a secure place in your car. The Dash Tray uses a thermo plastic design that grips onto your dash and won’t slip. Keep your phone in reach when you drive. Don’t be fumbling around looking for your stuff when you can easily find it when you place it on the Dash Tray. Buy 1 Today and get 1 FREE!